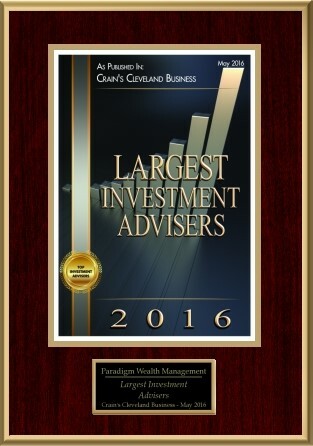 Paradigm Wealth Management provides the personalized service you should expect from your financial partners. We begin by having in-depth discussions with you in order to learn and understand your particular financial needs and goals. Once we have agreed upon an Investment Policy Statement, we utilize a broad array of products to build a customized portfolio that will support and build your financial future. Named one of the Largest Investment Advisors 2010 – 2016.
approach ensures a thoughtful blueprint, best positioning you to achieve your financial goals. We place our client’s interest first by providing consultative guidance, unencumbered by ethical conflict as an SEC Registered fee-only Registered Investment Advisor (RIA). Upon your request, we’ll coordinate with your other financial service professionals including estate attorneys and CPA’s to provide a synchronized solution. We collaborate with industry leaders like Fidelity, Betterment, Advent Software and MoneyGuidePro, to provide you with a better advisory solution and more analytical transparency. Assessment meeting to understand you current circumstances and clarify short and long-term financial goals and needs. Investment Policy Statements, written collaboratively with you to establish both short and long-term goals, needs and objectives. Frequent meetings with you and family members to assess your progress and any needed changes to ensure we are always working toward common financial goals and needs. Diversification within portfolios across several asset classes using modern portfolio theory concepts as well as disciplined rebalancing is critical to our process. Investments used include fixed income securities, equities, exchange-traded funds (ETFs), mutual funds, and third-party managers. Cost effectiveness, tax efficiency and risk-return trade-offs are key considerations for any chosen investment, not compensation. Offer of online comprehensive financial plan that provides informed guidance to realistically reach your objectives and avoid unforeseen risks that threaten your success. We handle a variety of accounts and services including Trusts, 401(k) rollovers, IRA distributions, charitable accounts/gifting, and bill pay. Paradigm charges no loads or surrender fees and has no lock-up period on invested assets.